Division. Conflict. A nation at war with itself. A battle for the soul of Finland. A wargame about a little-known moment in history. We hope that you have been enjoying 1918 – Brother against Brother and all the work that the team has put in making it! From opening the first copy off the presses to winning awards (see below), we have been fortunate to have had a hand in creating something enjoyed by players worldwide - even without any proper retail distribution. The quality of the components was a highlight for us, since this is the first game we have published. It is fascinating to see something only before seen through a screen, or earlier in just a homemade prototype, come to be produced. In this update we wanted to follow up with some post-campaign news and a useful document for you. We have received feedback on gameplay and replied to some rules questions and threads on BoardGameGeek. We have collected those questions and their answers in a "living document" that contains some clarifications that are frequently necessary in a card-driven game with so many different possible situations when they are combined. Like the game, the document is also bilingual. As mentioned above, it is a living document so any updates can be found from the same place. Please note the version and date on it. 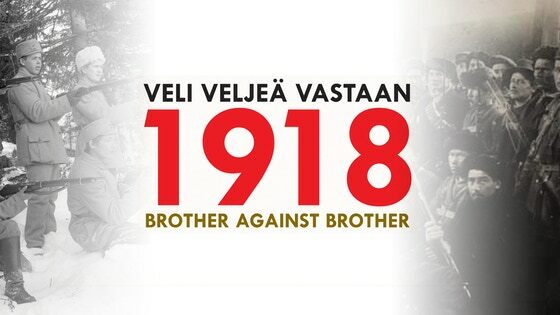 In a completely unexpected turn of events (really - this is not the most popular topic for a game, even in Finland), 1918 – Brother against Brother was selected by Finnish game bloggers as Gamers' Choice game for 2018. Of course there is a limited amount of Finnish non-family games published every year, but still, it was nice to have our efforts (and your support) validated. Thank you for making this possible! With that, we wish you happy holidays! We hope you enjoy some good games! We hope you are well, and we are very glad to announce that we have shipped 1918 – Brother against Brother to backers outside of Finland as well! We are aware of the unfortunate additional delay for the international shipping, it seems that we were slightly over optimistic when planning the shipping schedule and even small issues took quite a while to sort out during the summer holidays. All rewards have been shipped by Deutsche Post / DHL, and depending on your location, they may be delivered by your national postal service or DHL - apparently it varies even within a country, e.g. within the USA. Also, please note that, as mentioned on the campaign page, there is no tracking available. A note out delivery times: Please remember that we have no control over how quickly a package is delivered. That is in the control of your local delivery service. Deutsche Post / DHL is very, very efficient in getting the games out of Germany (they do not want to store them any more than they have to), and those are then handed off to your local authorities. Sometimes it may take inexplicably long for a package to be delivered, even when others in your area have received rewards that we shipped at the same time as yours. So please do not worry about non-delivery for least four weeks from now - until the end of September. We routinely receive returned packages (usually due to an incorrect address or non-pickup at the destination post office). Sending a replacement to you prematurely usually results in both packages eventually getting delivered. So, please give the package a chance to arrive - given how small Linden Lake Games (and LudiCreations) is, re-sending needlessly costs us a lot and diminishes our ability to make more cool games. As we have mentioned earlier in backer updates, let us remind you to contact us directly, with a message via the KS messaging system, if you have any issues with your pledge. Unfortunately we can not solve or track any issues via the comments, and you can't (well, shouldn't) post your personal information there. So, please message us to get our attention directly and promptly. With that said, here are a few pictures of your games as they were being labelled and right before they were picked up! Wrapped up and picked up! So, besides that, great news! We are very pleased to say that the quality of the game is indeed very good. The game came out as we hoped it to be - and the map is especially a piece of art! All copies of the game have now been moved to our warehouse, and are getting packed. We will lock your answers about the address where to send the game at the end of June. If you have any changes please make them before that. After this we can proceed with shipping your copy. We will be posting another backer update when that process has started. Thank you again for your patience! It has been an enlightening experience to create this, and very soon you will be enjoying playing it as much as I have getting the first copy! Greetings from an unusually warm Finland! We have great news. Production is rolling along, and we are ready to start receiving your address information. We have been working with Backerkit to get ready for asking for your addresses. Today we are pressing the button to send the surveys! Please read the instructions at the beginning quite carefully before you type "yes". Even though this is our first campaign and we need to be very thorough, we are working with LudiCreations at each step. You do not need to create a BackerKit account to fill out your survey, just click on the link and complete the survey! You will there be able to provide your address, sign up for our newsletter, and add another copy if you like. Please check your spam folder if the email does not arrive by Tuesday 29 May. If it is not there, you can always access your information here: https://1918.backerkit.com/. If you have any questions or if there is any trouble with your survey, please contact support at https://1918.backerkit.com/faq, click "Contact Us", and the nice Backerkit people will help you out! Thank you again for your continued support and especially for your patience in this slight delay. We are learning from the process, and we are so very excited to hear your stories of 1918 and the civil strife in a new nation! As ever, if you ever have any questions or issues about your pledge, please send us a message via the KS system. The Civil War in Finland ended 100 years ago. The parade of victorious Whites in Helsinki was held on the 16th of May 1918. Our project is soon coming to the end but unfortunately not quite as quickly as we have hoped. We had to adjust our graphics specifications quite a bit. Unfortunately we did not receive comments until after paying the advance fee (which we could do after Kickstarter funds were released to us). This did not have any effect on the quality of the game, but unfortunately it took enough time so that in according to the latest information our production slot was pushed to June. We will then start sending games without delay once we have them. We are indeed not happy with this state of affairs. However it is our view that one month delay is much preferred to the games being of unsatisfactory quality. We aim to send you a survey for your shipping details by end of the May.